Singapore Cable & Thai Press Self Censorship | thaicables - It's Your Right to know the Truth! Bangkok we decided to include a blog post about it. that are likely to spark intense political controversy in the region. positions in Singapore’s Foreign Affairs Ministry, all give US officials damning assessments of Malaysia. labelling Thaksin Shinawatra as ”corrupt” along with ”everyone else, including the opposition”. also saying that Mr Kausikan warned of continued instability in Thailand. affairs officials on Malaysia, Thailand and other countries in the region. Sunday editions, Asiaone online reported Sunday. Bilahari Kausikan and Tommy Koh. still holds that position. Koh is the ministry’s ambassador-at-large. “technical intelligence”, which is likely to relate to intercepted communications. but walked into it anyway”. at his replacement, Abdullah Badawi. neighbour, Thailand reported the Australian press. linked to one of Mr Najib’s aides. neighbouring countries and their state of affairs in his 2008 report. produce “an Asian reprise of the breakup of Yugoslavia”. incompetent or stupid, cables from Wikileaks revealed Sunday. Secretary of Defence for East Asia David Sedney in a cable dated September 2008. 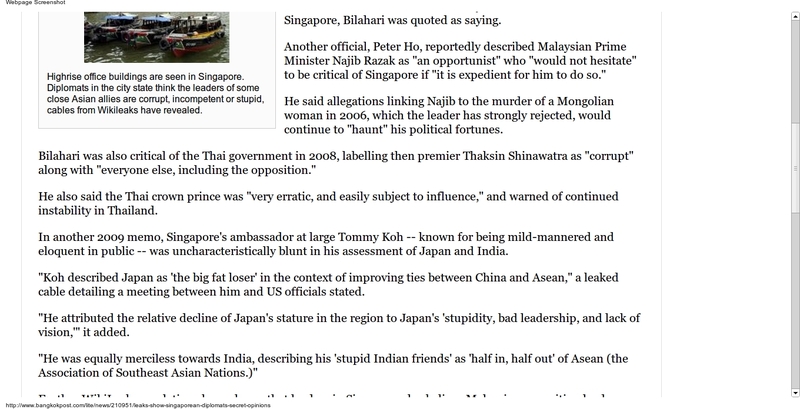 “flee” Malaysia and “overwhelm” Singapore, Bilahari was quoted as saying. and warned of continued instability in Thailand. in his assessment of Japan and India. China and Asean,” a leaked cable detailing a meeting between him and US officials stated. bad leadership, and lack of vision,'” it added. trap set by his enemies. by Australian and Singaporean intelligence on the opposition leader’s case. he is currently indicted’,” the cable read. which a Fairfax report said was likely to involve intercepted communications.